The beauty of having points and miles is the ability to take trips last minute, even on holidays – and get a room for a decent rate. 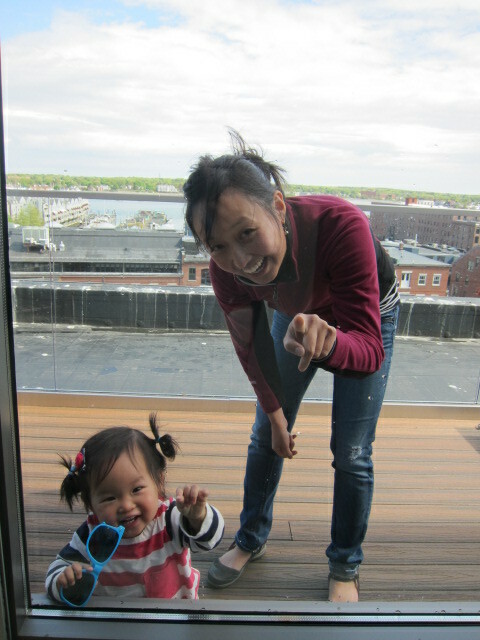 Four days before Memorial Day weekend, Jess and I decided to take Baby M up to Portland, Maine for the weekend. I found award space at the Hyatt Place Old Port in downtown Portland. Rooms were going for $280/night, but it only cost us (and our friends who joined us a day later) 8000 points/night. I just transferred 16,000 points from Ultimate Rewards for the two nights and got a value of ~3 cents/point. Not a bad deal. When we got to the hotel, we were in for another surprise. 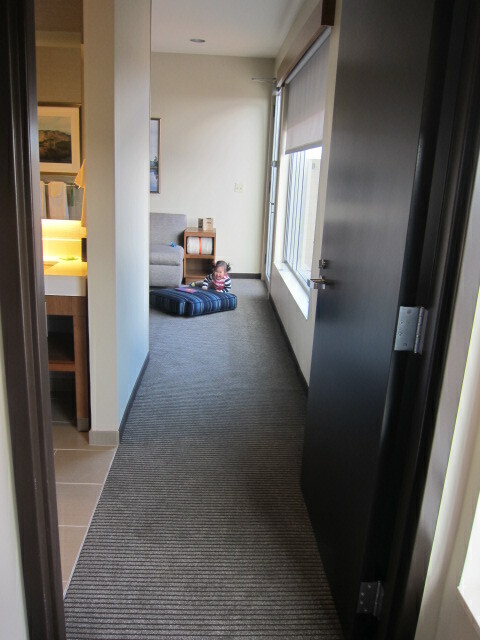 I’m currently in the midst of a Hyatt Diamond challenge (which unfortunately I don’t think I’m going to complete), so we received an upgrade to a suite on the top floor, but that wasn’t the surprise. What I didn’t know was that the Hyatt Place Old Port had just opened the Tuesday before that weekend! So we actually were the first people ever to stay in our suite. Pretty cool. The suite itself was pretty nice. There are two rooms – a living room and a bedroom, with a pretty large bathroom in between. There’s no door to the sink area of the bathroom; it’s more of a hallway. The toilet and shower of course have their own partition. 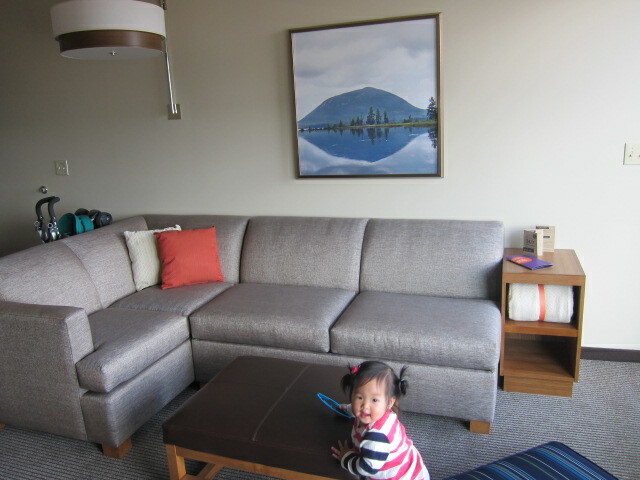 The room comes with a sofa bed, two TVs, and a completely empty fridge (which was really useful for Baby M’s supplies). My favorite part of the suite was the balcony. It was a big hit with the kids (they got to run in and out), but I also think it would be a really nice place to have a drink or chill out if you are traveling without kids. One downside is that there is a lot of seagull…refuse up there, though they did a great job of keeping the balcony itself clean (it’s just the adjacent roof that’s soiled). 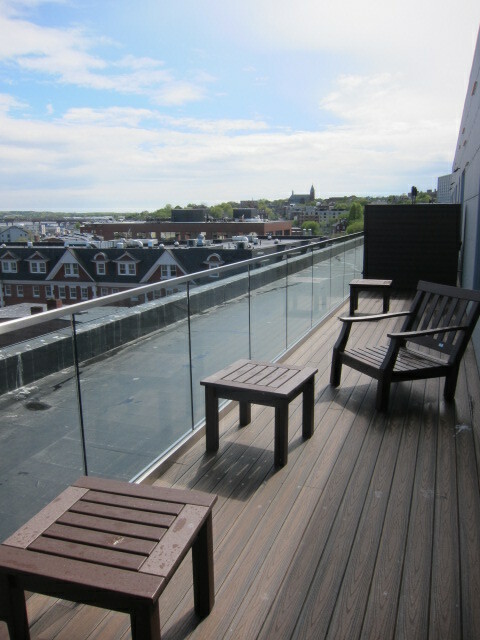 The balcony comes complete with lawn furniture and the weather was perfect, so we just really enjoyed being out there. 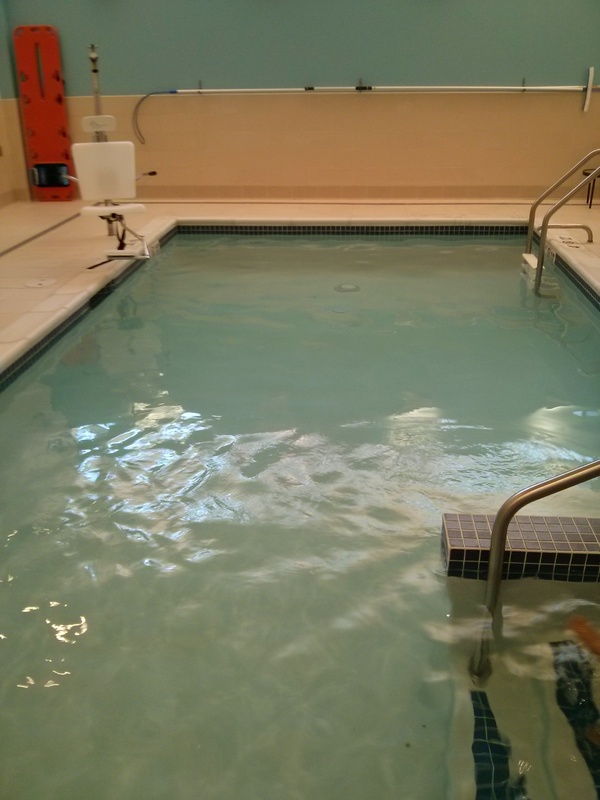 The website advertises that the hotel has a pool, which I guess is technically true. The pool is pretty small though; it’s pretty much useless if you want to swim laps. It is however very useful if you have kids or are a kid who just wants to splash around and have some fun. The first night, Jess tried to go down for a quick dip, but said that it was filled with 10 little kids who were going nuts. Sounds fun to me! But maybe not great if you are an adult who just wants to relax. The hotel also has a small gym which is whatever. There is a bar and a lounge area which was pretty happening at night. The free breakfast is served in the lounge in the morning. Breakfast was pretty good with a small assortment of hot items that changed from day to day and the regular bagels/toast/cereal you would expect. The hotel has no vending machines (I think it’s a Hyatt Place thing) but there are snacks for sale in the lobby 24/7. The staff was very friendly and you could tell they were genuinely excited to be opening the hotel. There were some things that were a little bit off – our friends’ room had some leftover items from previous guests, our lawn furniture cushions were just kind of strewn about the floor when we checked in, and various things like that – but I think that more is a function of the hotel being so new. The staff was super helpful and friendly and the front desk very responsive when we needed them. This is a good place to note that Portland is a very lively town at night. Like, live outdoor bands playing until midnight lively. It didn’t bother us, but if noise is something you can’t handle, you might want to ask for a room facing away from the main drag. The view won’t be as good but it’ll be much quieter. There actually was a note in our room to the effect of “here are some earplugs for you!”, but said earplugs were nowhere to be found. We wouldn’t have used them anyway, haha. 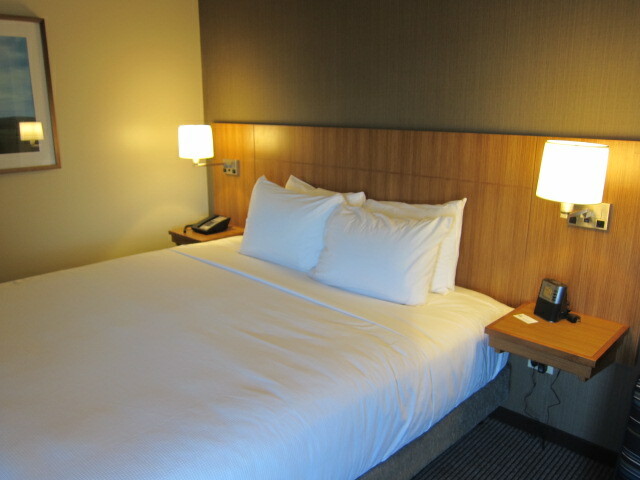 The last time we were in Portland, we stayed at the Hampton Inn which is a great hotel. But personally, I think the Hyatt Place is even better. It’s more centrally located, it’s newer, and it costs less points (even if you value Ultimate Rewards/Hyatt points more than Hilton points it’s 8000 vs. 40,000). I think now that the Hyatt Place has a few weeks under its belt most of its kinks should be worked out. We saw the regular room – it was quite spacious and even had a little partition between the sleeping/living areas, so even if we hadn’t been upgraded we would have had plenty of room. 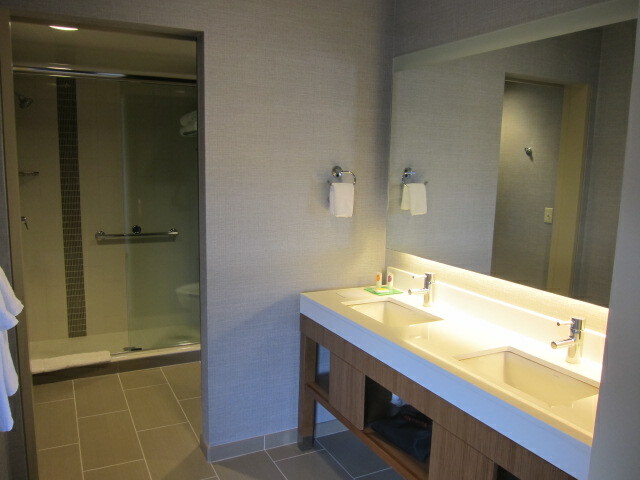 Bottom line – if you’re going to Portland (which I highly, highly recommend, especially to native New Englanders) – the Hyatt Place is a great choice! In the next two posts of this “cannot possibly be as long as Bora Bora” trip report, I’ll touch on some great eating options in Portland and family fun for everyone! And beer! Unfortunately, since it looks like I’m going to fail this challenge I don’t think I have a lot of advice. What I’d recommend is only signing up when you have a lot of travel coming up. Also, points and cash bookings count towards the status (while straight up awards do not), so if you can find availability for points and cash you can save a lot of money that way too. Yeah, also can’t get enough of baby M pictures. Seriously.